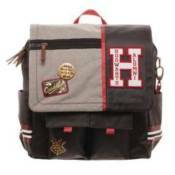 Show your school spirit with this new Hogwarts backpack! HARRY POTTER GOLDEN SNITCH STICKER KIT HARRY POTTER HERMIONE?S WAND WITH STICKER KIT: LIGHTS UP! HARRY POTTER WINTER HOGWARTS MAGICAL COLORING SET HARRY POTTER WIZARD?S WAND WITH STICKER BOOK: LIGHTS UP! HARRY POTTER ALBUS DUMBLEDORE ROCK CANDY HARRY POTTER BELLATRIX & VOLDEMORT VYNL. HARRY POTTER DEMENTOR MAGICAL CREATURES HARRY POTTER DOBBY & HARRY VYNL. HARRY POTTER LORD VOLDEMORT ROCK CANDY HARRY POTTER LUNA & NEVILLE VYNL. HARRY POTTER US EXCLUSIVE HERO WORLD 5-PACK [RS] HORROR FREDDY KRUEGER & JASON VOORHEES VYNL.